This entry was posted on Sunday, August 7th, 2011 at 03:47 and is filed under Barack Obama, Economics, Politics. One could look at the headline and assume they’ve had one too many beer summits at the White House, yet the story on The Hill asserts flatly that not only are these spend-a-holics serious, but also that the S&P’s downgrade essentially demands it. They can’t honestly believe the path to restoring our nation’s AAA credit rating lies in more taxes on the wealth-producers. As the President weaves from curb to curb, it’s clear that the nation is in desperate need of sober, capitalistic leadership that it’s not likely to get from Obama. As ordinary Americans struggle, small businesses fail, and banks foreclose on record numbers of homes, still drunken with power, the statists run rampant, spending your money as though it had been their own. This President claims that his predecessor, who is famously to blame for all things, put the car in the ditch. Even if that had been so, ignoring evidence to the contrary, wouldn’t you want a new driver behind the wheel who can pass a roadside economic sobriety test? 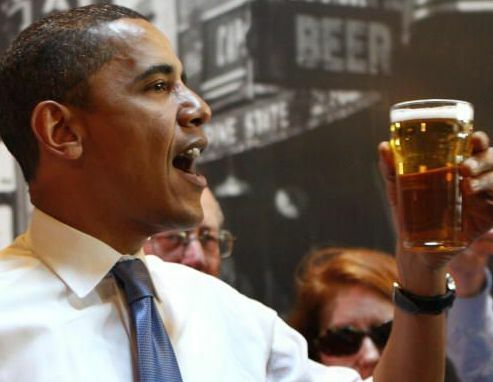 If economic intoxication is the standard of measure, Barack Obama and his cohorts in Congress have just blown a 2.0. It’s not credible to suggest, after one too many nights of painting the town red, that the national hang-over we now face hasn’t been long overdue. After all, it’s not as though the people Obama and Reid wish to tax are the ones who returned stumbling to their beds at 4am. The people they wish to tax are the same people they always seek to hit up for one more round: Those who rise each morning and produce the wealth upon which such besotted ne’er-do-wells as this pair can thoroughly rely. The Federal government of the United States will spend an astonishing $3.7 Trillion in FY 2012. Stepping that off in heel-to-toe fashion, for a man the President’s stature, that’s roughly 700 million miles. That’s a trip to Jupiter, with side-trips to all its moons, assuming he had the manned space flight program and a flagon of lager sufficient to carry him there, and that he could maintain himself along a straight line. Meanwhile, the government takes in roughly $2 Trillion annually, which is more than enough to finance the essential needs of government. Of course, defining what “essential” means is a larger part of the trouble, isn’t it? To politicians like Barack Obama, there is never sufficient money to spend on all the things they believe to be essential. Much like the tipsy fool whose eyes grow ever larger than his constitution permits, the more inebriated he becomes, the more likely he is to demand larger and larger mugs-full at a faster rate from the tap. Of course, since he’s run up the mother of all bar-tabs, he’s not to be trusted with much, since he barely keeps ahead of the bar-tender’s patience. This is the nature of our situation, and all pretense by those in power to the claim that if they could have “just one more drink, just a wee bit more,” all would work out in the end. This only serves to beg the question: Whose end? The American people are right to demand that the bar-tender cut off this particular patron. He’s not capable of self-regulation or self-control, and what we now need for our government is a twelve-step program of another sort. Rather than focusing on our president’s addiction to our money, and how to quench his thirst for more of it, we must simply cut him off. There are some things and some times in which the only rational answer is to quit cold-turkey. No easing-up, no gentle backing-away. This spender has lost control, and he needs the helping hand of compassionate countrymen who care enough to tell him “no” and mean it. The answer to this downgrade has always been to cut spending, immediately. Any suggestion to the contrary is the bar-stool philosophizing of that fellow who’s stayed one round too long. As the drunk overstays his welcome, so has this President, his advisers and his policies. It’s well past time for we, the bouncers, to show him gently to the door next November. We’re a compassionate sort. We’ll even spring for the cab-fare home. Mark, just found your blog — good reading. Thanks! I have to take exception, however, with blaming the President (alone) in today's post. It's also Bushes fault for starting conservatives down the path of thinking this crap could actually be done from a conservative-position. It's also the fault of the Dems in both houses. It's also the fault of the Repubs in both houses who went along with this crap, starting way back in Bush's day. It's also the fault of the Repubs in the House who caved last week. It's both parties, with only a handful of exceptions. The problem in blaming the President (alone) is that it conveys to the less-informed reader that the problem can simply be fixed by voting him out in 2012. It can't, and it won't. The less-informed reader should be challenged to learn whether or not their reps are legitimate fiscal-conservatives (and whether or not they've always been so or only recently in an attempt to save their hide) — and to look forward to voting out their reps at the earliest-possible opportunity (if they haven't been staunch fiscal-conservatives). By focusing on the President we *might* oust him but he's only part of the picture. If we don't overturn 75% of congress, the problems won't stop — they might slow, but they won't stop — and the definitely won't *REVERSE*. By instead focusing on the reader's reps we stand a chance of having a major overturn in congress (granted, not 75% in the first go) — and send a frightening message to the Pres. (if he remains, or even to the next one) and the reps who remain. The wheels might actually stop, maybe not reverse, but at least stop. That would give momentum to the public who might be energized to repeat the same thing 2 years later — getting the majority needed to actually reverse the train. In some respects, the President is a red herring. Yeah I've already found this to be true; thanks for a great site! I guess I'm fired-up lately with the big-name pundits (mostly) blaming the President. "Our" message lately seems pretty heavy on "anti-Obama-ism" rather than "anti-socialism/big-govt and pro-true-capitalism/conservatism". I'm worried our message is starting to sound bitter and partisan rather than angry and honest. And I'm worried that many in our camp are contributing to that image. Having said that, you're right — this one post aside (which shouldn't have been consumed in a vacuum, sorry about that! ), you aren't doing that. Thanks! Marks post is just that, a post, not a book. As he has suggested, this one must be read in the context of his other posts. He hasn't missed a thing, he just hasn't put it all here. Great post, Mark – as usual! Let's allow that he's new to the site, so hadn't yet found my other articles. Many new readers arrive daily, so it may take them some time to digest all that's here. Let's encourage them to stay 'round long enough to do so. Thanks! Good article Mark. To bane – I can't begin to tell you how many excellent articles you will find here…….if you keep going back. Yet, I can also tell you it will be WELL WORTH YOUR TIME! !